Bill Vander Zalm deserves some respect. He’s a political entrepreneur of enviable skill. With nothing but a great big grin and an inflated sense of outrage, he mobilized hundreds of volunteers across B.C. to collect an incredible 700,000 signatures against the Harmonized Sales Tax (HST). It was a feat probably without parallel in our province’s turbulent political history. Thanks in no small part for “the Zalm” and his relentless, populist FightHST campaign, polls showed some 80% of British Columbians opposed to the HST at the peak of the tax’s unpopularity. Yet, with the HST referendum weeks away, Ipsos-Reid now tells us that a narrow majority of British Columbians now support keeping the HST, rather than going back to the old PST + GST system. This development coincides with a series of government-sponsored HST Forums being held at universities and colleges across the province. The event held last night at Thompson Rivers University (TRU) in Kamloops provides some insight into why the movement to keep the HST is gaining momentum, while Vander Zalm’s FightHST is sputtering to a seeming halt. The HST Forum at TRU featured, on the pro-HST side, a Vancouver tax lawyer named David Robertson; Sue Porter, an accountant with KPMG in Kamloops; and Judy Guichon, a local rancher. Meanwhile, the anti-HST camp was represented by Vander Zalm himself, along with Fight HST spokesperson and BC First party organizer Chris Delaney. Throughout their campaign against the HST, Vander Zalm and Delaney have pushed a narrative about a tax that’s bad for consumers, and good for big business. This is a fundamentally flawed argument, since large corporations aren’t even eligible for input tax credits, which instead go to benefit small- and medium-sized businesses. But that hasn’t stopped Vander Zalm and Delaney from presenting their struggle as a fight for the little guy against a big, bad government with its hand permanently in our pockets. This narrative is hard to maintain in a debate where a tax expert and two trusted, local businesspeople are put up against a smooth but disgraced ex-premier and a party-jumping political operative. At the Kamloops forum, a pattern was quickly established where Vander Zalm or Delaney would loudly recite a populist, simplistic attack against the HST, then be countered by Robertson or one of his colleagues with often-overlooked facts. Delaney, for instance, blasted the notion that the government is taking our money from us, then condescending to give some of us a little bit back in the form of rebates for low-income earners and seniors – to his mind, a ludicrous notion. In response, Robertson patiently explained the virtues of charging everyone the same sales tax at the till, then using some of the revenue to offset costs to those who can least afford them. This back-and-forth of populist rhetoric followed by common-sense explanation became very familiar over the course of the evening. The strangest moments of the debate, though, undoubtedly came from Bill Vander Zalm – not surprising, perhaps, from a premier who was forced to resign over financial irregularities involving his “Fantasy Gardens” theme park. In his opening statement, Vander Zalm complained that the government’s $250,000 in funding to Fight HST doesn’t go far enough – strange, coming from somebody who argues that government is over-taxing us. He made several wild claims about the HST in other jurisdictions, claiming, for example, that value-added taxes are responsible for “millions of people suffering” across Europe, and even for the Greek financial crisis. 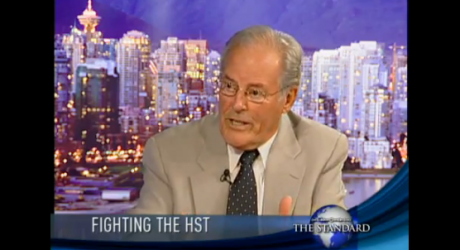 (These are not his strangest arguments to date – Les Leyne of the Victoria Times-Colonist quotes Vander Zalm warning in Prince George that the HST is a plot of the “New World Order”). When he considered it necessary, he issued dire warnings about the influence of various forces from the European Union to China to the province of Quebec. When his back was truly the wall, he lashed out at Robertson, dismissing him as “a lawyer with a nice six-figure salary” – much as he dismissed the onerous paperwork small businesses faced under the PST as “not a big deal”. The technical aspects of the HST, and its actual effect on the economy compared to PST+GST, did not appear to interest him at all. Vander Zalm conveyed, at times, the impression that he was not participating in the same debate as the others on the stage. There were many who murmured darkly at the outset of the anti-HST campaign that Vander Zalm was in this for himself – to regain the spotlight that has shunned him for so long, and to redeem himself from a scandalous tenure in government. These criticisms were easy to dismiss while his grassroots movement was fanned out across the province, collecting hundreds of thousands of signatures against a hated change to the tax system. Today, however, those who oppose the HST on legitimate grounds need to ask themselves if Vander Zalm, and cohorts like Delaney, are the right people to be speaking for them. British Columbians deserve a factual, reality-based debate on the HST – and these two populist politicians are ill-equipped for that contest. The dramatic shift in public opinion in favour of the HST makes this very clear. Image: Bill Vander Zalm screen capture from his appearance on JoyTV’s The Standard on 30 September 2009. It is too bad that someone with more credibility than the Zam and his partner would not provide a more balanced “Con” side to the HST. I just don’t believe anything this guy says however, I am sure there is some truth to the concerns he expresses. As for the Liberals, their recent announcement about the reduction to 10% just tells me, they have no clue on how to handle this matter. It should have remained as is and let the voters decide for themselves.